1. We were in the middle of a cold spell (Ottawa in May...you just never know). 2. I needed to make something that was freezer friendly, since we are going on vacation and I knew I wouldn't be able to get through my groceries in time. This way, I could make enough for weekend meals, freeze the rest, and not have to worry about fresh veggies going bad. 3. 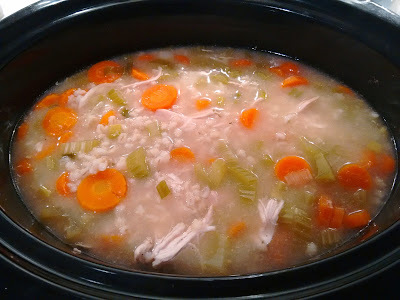 We went to Panera for lunch last week, and I had a bowl of chicken, lemon and orzo soup that was very good, so I wanted to try a similar recipe. If you prefer boneless, skinless chicken breast for this recipe, feel free to swap that. When I looked at the chicken at the grocery store, it had a lot of fat on it, and the turkey breast looked more appealing. I also chose to use barley because it's a whole grain, and it will stand up to the cooking time. Barley is whole grain that is high in fibre, protein, potassium, and iron. One cup of uncooked barley will yield three cups cooked (you will need to use three cups of water to cook it, which is why there is a lot of water added to this soup). Barley contains gluten, and has a chewiness similar to that of past. It has a mild nutty flavour. Pour the barley on the bottom of the slow cooker pot. Layer garlic, green onions, celery, carrots and turkey breast. Add olive oil, lemon juice, thyme, rosemary and black pepper on top of turkey breast. Pour in broth, and add water to top up. Add bay leaf on top. Cover and cook on high for 4 hours. When 4 hours is complete, remove the bay leaf, and break turkey breast up into pieces. Stir soup together and serve.